CLICK ON THIS COOKIE FOR A GREAT HOW-TO VIDEO OF WRAPPING GOODIES! The suggestions on packing and shipping cookies have consistently worked very well to make sure cookies arrive in one piece (we hate the long faces that a pile of cookie crumbles creates!). It takes a little extra time, but it’s worth it to make sure the kids get your cookies in perfect shape. The ideal method is a vacuum sealer, if you happen to have one. PLEASE DO NOT USE "PRESS-N-SEAL" WRAP. It takes WAY too long to unwrap!!! Ship cookies a WEEK BEFORE your sponsor date to avoid expedited shipping costs. 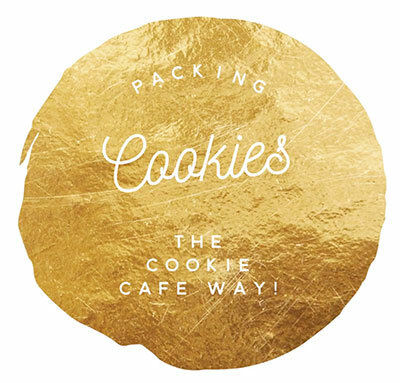 Jot your name on the ziploc bags containing your goods (we want to be sure that your name accompanies your cookies on Cafe day!) and pack them between whatever you have handy to cushion with; bubble wrap, newspaper, chips, whatever. If you send foil pans of bars or brownies, leave them uncut, wrap them well in plastic wrap, and place a piece of cardboard on top of each pan to keep them from crushing. Place any pans at the bottom of your box, and cookies on top of them. Please be sure to write FRAGILE on the box and draw arrows pointing “up” around all the four sides. It really helps to indicate “up” so the box doesn’t arrive upside down. IMPORTANT: Put your name and return address and sponsorship date on the outside of the box so we will be sure that your cookies are used on the right date. 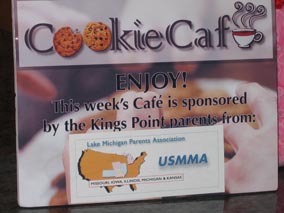 You may send the cookies several days prior to your sponsorship date, as they will be frozen until used. Try to avoid having the cookies in transit any longer than possible, and try to avoid having them sit static on a Sunday.